There are some things a robot can't do, but catching a flying object is no longer one of them. 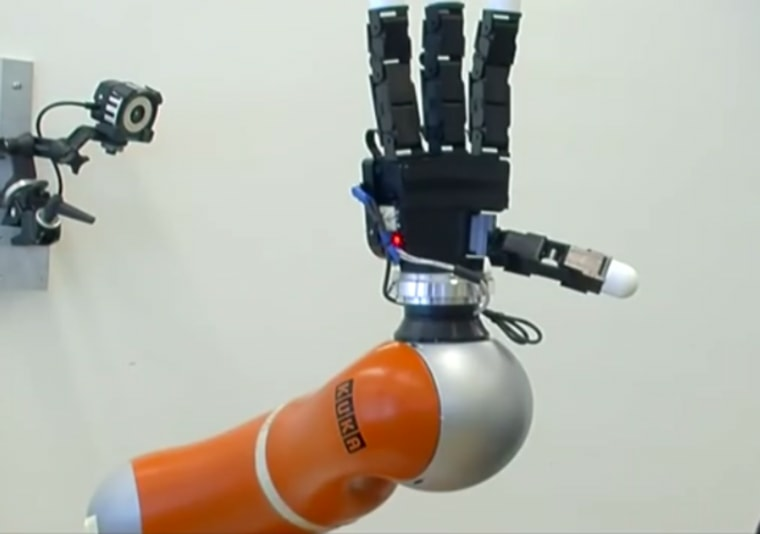 With its four-fingered, three-jointed hand, a new robot can catch a ball, a bottle or a tennis racket thrown in its direction in less than five-hundredths of a second, researchers reported today (May 12) in the journal IEEE Transactions on Robotics. Fast-reacting robotic limbs have many potential applications. They could be used on satellites to clean up some of the space junk in orbit, or on cars to reach out and break an impact. To catch flying objects, a robot must react to unpredictable events and integrate several pieces of information in very little time, the researchers said. Many robots today have preprogrammed behavior, and make calculations that take too long for them to respond in a rapidly changing situation, such as to catch a moving object. To achieve such rapid responses, researchers took inspiration from human learning methods of imitation, and trial and error. They used a technique called "programming by demonstration," in which the robot is not given specific instructions. Instead, researchers manually guided the arm to a catching position several times, until the robot learned to move into position itself. The team tested the arm by throwing several different objects at it: a ball, an empty bottle, a half-full bottle, a hammer and a tennis racket. These objects have different centers of gravity, presenting unique challenges for the robot. During the first learning phase, the researchers threw objects at the robot several times. The robot used a series of cameras positioned around it to measure the trajectory, speed and rotation of the object in order to model its movement. It then performed a speedy calculation to move itself in the right direction, correcting its trajectory in real time and synchronizing its finger movements to catch the object. The robotic arm is already being used as part of EPFL's Clean-mE project to develop technologies for recovering and disposing of space junk orbiting the Earth, researchers said.